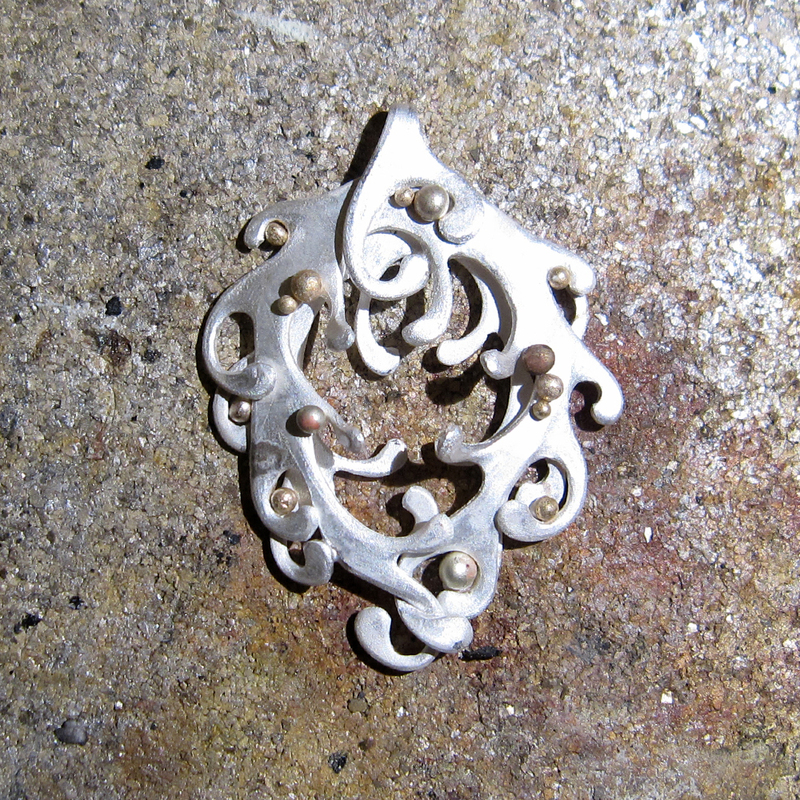 My jewelry is very much inspired by fairytales – or at least looks like it could have emerged from one. 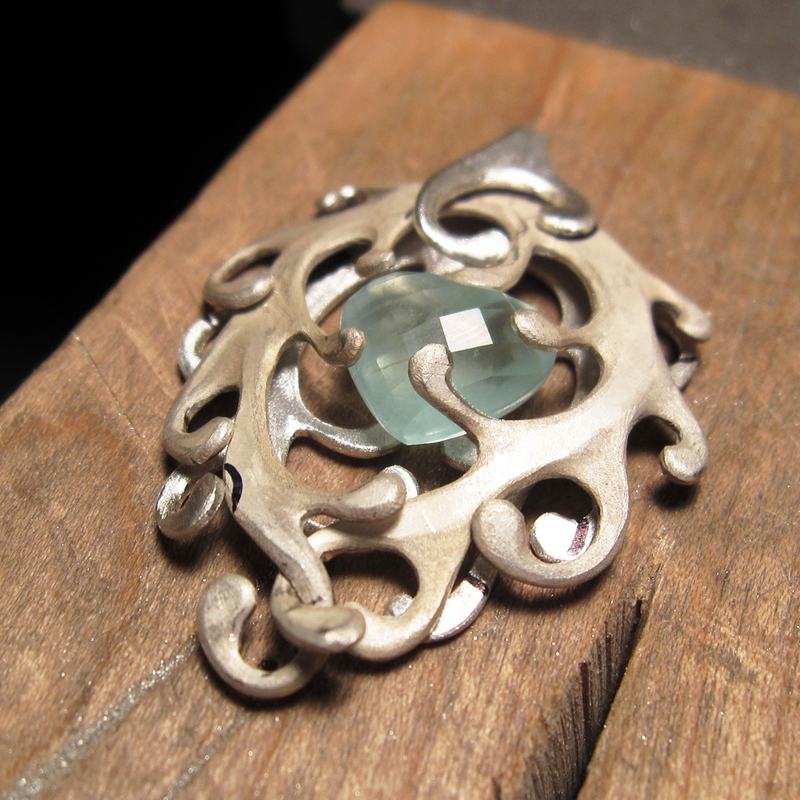 Once in a while I like to create something which refers directly to a specific fairytale. I have made a Snow Queen brooch and a Rapunzel full – body adornment and now I felt like paying homage to the Little Mermaid, another story by the Danish author Hans Christian Andersen, which he wrote in 1836. Actually I have been dreaming about creating this necklace for the last two years, when I happened upon a lovely facet cut aquamarine heart. I have made countless sketches, which I have abandoned again, because they just didn’t work. And so I went back to square one and started pondering on the story: What was it that happened in the end? 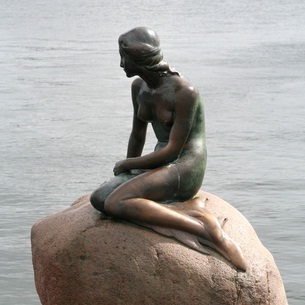 The text says, that as the little Mermaid dies, her body dissolves into foam, but instead of ceasing to exist, she feels the warmth of the sun; she has turned into a spirit, a daughter of the air. The other daughters of the air tell her she has become like them because she strove with all her heart to gain an eternal soul. Especially since she refused to kill the prince in order to regain her fish tail. Now she will earn her own soul by doing good deeds for 300 years; for each good child she found, she would obtain one year less while, for each bad child, she would cry, and each tear would mean one month more and she will eventually become an angel. Well, I would like to believe, that the physical heart of this tragic figure, which so valiantly dies for love, petrifies into an aquamarine during this cleansing process. This beautiful facet cut stone eventually washes ashore to be found amidst the glittering seaweed on the beach. Right. 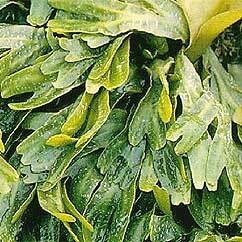 Seaweed. That’s some black stuff that smells bad when it dries up, but while still fresh it is actually rather soft and glittering from the water. I chose to do a combination and went for a design made of two layers of seaweed cut from a sheet of 1 mm silver, adorned with balls of 14 k gold and 5 diamonds set in some of these balls for glitter. 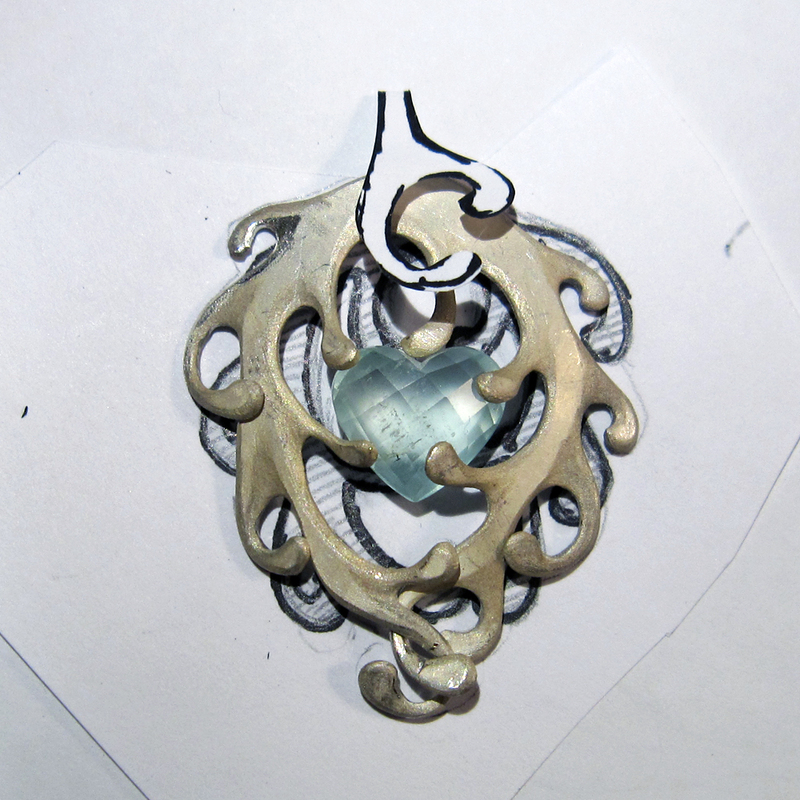 The silver was to be oxidized for contrast. The pearl? Well, it looks pretty and has a natural sea-touch to it, right? A sketch, the stone and the outer layer of seaweed. 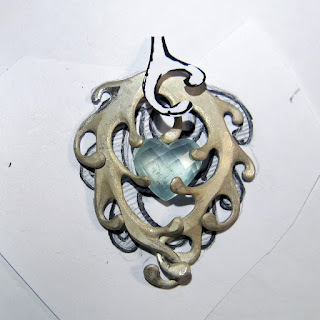 I have already filed the edges of the silver into soft, 3 dimensional shapes to give it the organic grown texture. Then the back layer. 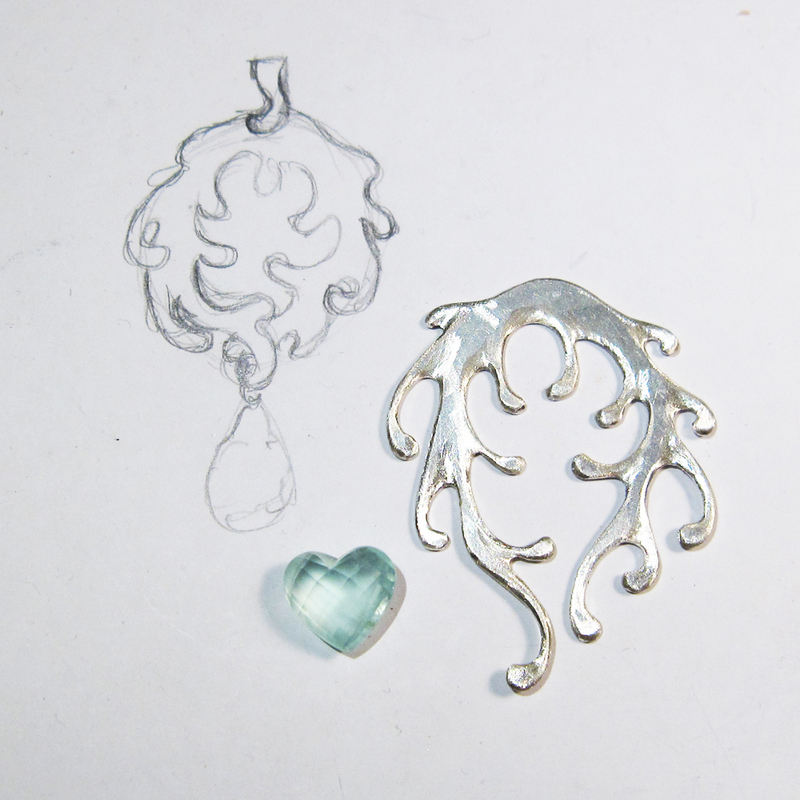 I cut out the part of the seaweed which was going to shape the hoop and folded it down over the finished silver part. Then I started sketching: Where would it be most harmonious to have the back part peeping forth? Balance was very important! This was the result. No symmetry (I hate symmetry) but balance – absolutely! The back layer is cut, filed and bent into place. Does it fit? Yes it does! Now the golden balls. Again: Symmetry is out, but balance paramount. After setting the heart and the diamonds (a total of 0,09 carat W/VS), I carefully oxidized the piece and attached the pearl. I have to say, it looks fabulous! 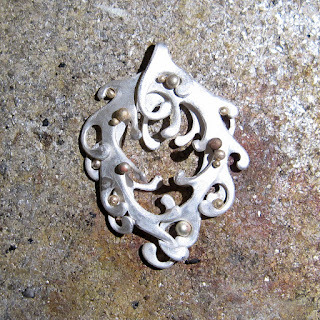 Not exactly a lightweight piece of jewelry, but oh so sumptuous! 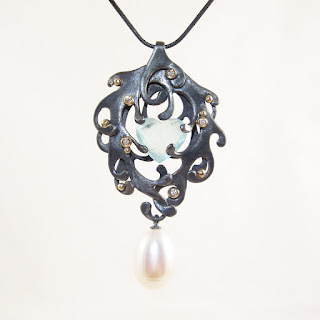 In the gallery I have created this little display for the necklace, explaining it and giving it the perfect backdrop. The blown glass bell gives a lovely rippled effect as the light shines through – just like it would had the sun been shining through shallow water. Your imagination is absolutely spectacular . 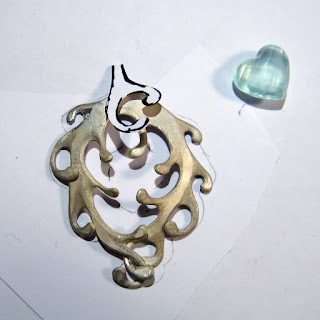 How you make these wonderful connections to make your jewelry .. I am absolutely in love with each and every piece of art . Thank you .